We would like to share with you some of the fun activities we have done this September. Let me start with this: The manta season is still on! We can never get tired of this magnificent animals! It has been a MANTASTIC month! And when we go there, not only we see between 2 to 8 mantas but also you have a lot of marine life surrounding them, like took it out of an underwater documentary. Normally we also have turtles swimming by, white tip sharks and plenty of beautiful fish! It is an ABSOLUTE BLISS! 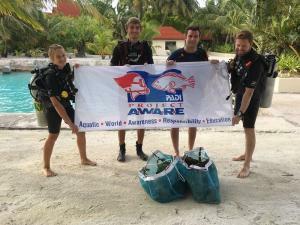 This month there was the AWARE WEEK by Project Aware and PADI from the 15th until the 23rd of September. During this week we hosted two events. 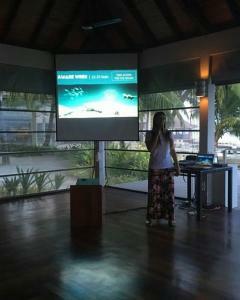 The first one was a presentation about Marine Life and Awareness were we could talk to the Kurumba guests about the different reef types of the Maldives, characteristics about some of its marine life like sharks, turtles, mantas, among some others. We finished the presentation by mentioning some of the actions we can take to help save our oceans like avoiding single plastic use or using alternatives for it. 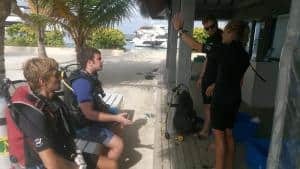 The second activity we hosted for AWARE WEEK, was an underwater cleanup in our House Reef where we could clean some of the debris that gets washed up to the island from other places. It is important that we all take part on activities like this, every single effort counts. We want to finish this newsletter by congratulating all the people that got certified with us this month! Very good job from our customers Apoorva, Sunil, Mishank, Nahla and Abdulah while completing their Scuba Diver Course!! Well done guys!! Also, we want to congratulate Captain Ahmed and boat crews Masith, Siraj and Hussain for completing the Open Water Course. Kurumba Resort sponsored these gentlemen to get their diving certification so they can further their knowledge of sea related activities. They are all very enthusiastic people and did a great job during the course. Congratulations guys!